For someone who travels as much as I do, I discovered cruising embarrassingly late. While most of my friends had spent a spring break, a family vacation, or a honeymoon at sea, my self-imposed rule was that all of my trips must take place on land. Cruising would be too boring, I rationalized. The time in each port would be too limited to really enjoy the destination (I mean, isn’t the destination the whole point?). Plus, people get sick on cruises. And there could be pirates (seriously – while thankfully rare, this happens). I decided—just once—to break my no-cruising rule in 2013, when my parents and I traveled to Europe. We had two weeks and a goal of seeing Oslo and St. Petersburg, and the most economical way of getting from one end of the Baltic Sea to the other seemed to be by boat. After a few days exploring Oslo we flew to Copenhagen and boarded our floating hotel. After ten days of delicious food, stunning sunsets, and amazing entertainment, the staff practically had to drag us off the ship to send us home. My opinion on cruising changed forever. 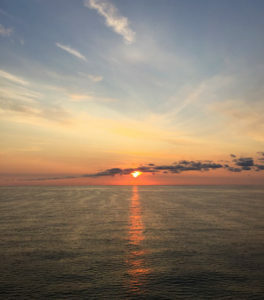 Cruising is one of the easier vacations from a planning perspective, since they are largely all-inclusive, and if you are looking to get the most out of your vacation time they are a wonderful option to consider – board, unpack once, and enjoy. If you are looking to maximize your experience with specialty dining or the perfect room you’ll have plenty to consider before—and even during—your cruise. 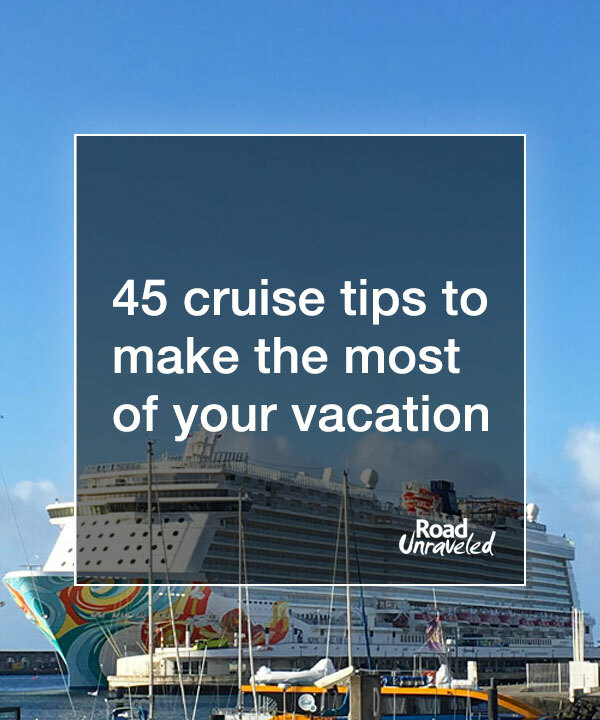 That’s why my dad Craig and I have teamed up to share 45 cruise tips to make planning and taking your next cruise a fantastic experience! There are many possible goals for vacation time, and cruising can be a great choice to achieve all of them, but to get the most out of your time and money your first decision should confirm what kind of vacation you want to experience. Do you want to see a new part of the world? Do you want nonstop activities on the ship? Perhaps you want the kind of vacation where you do nothing at all. Are you planning a romantic vacation for two, a getaway for friends, or a trip for your whole family? Think about your end goal: at the end of your cruise, will you have achieved what you wanted in the first place? If you spend a few minutes deciding what kind of vacation you want to take, you’re less likely to be disappointed with your experience—after all, if you are dying to visit a place like Bermuda or Dubrovnik but select a cruise that docks there for just six hours, you might be left wishing you planned a little differently. Cruise ships range in size from just a few hundred passengers to several thousand, and there are benefits to each ship size. Smaller ships can provide a more personal experience; you have a better chance of getting to know fellow travelers as well as the ship’s crew since you will regularly see the same faces at meals and activities. Smaller ships are also easier to navigate, and not just for the captain. 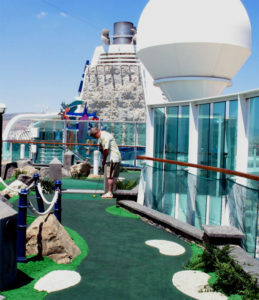 Larger ships tend to have a wider range of activities, and you might see anything from water slides to Broadway-class shows to rock climbing walls to, yes, even go-kart tracks. Take some time to learn about the ships that are options for you based on your needs, interests, or planned itinerary. You may decide you need nothing more than a comfortable room and a lounger by the pool, or you may find you can’t imagine your next vacation without a skydiving simulator. You’ll find cruises of every length, from quick overnight jaunts that just take you out to sea to multi-month, around-the-world journeys that stop in dozens of ports. Most itineraries will range between a couple of days and a couple of weeks, so think about the amount of time you have to invest in your cruise. Don’t forget to think about the amount of time it will take to travel to and from your first and last ports, especially if the port is not close to your home. When it comes to cruising, you will find no shortage of incredible places to visit or seas to cross. Is there a specific port or city you want to visit? Do you value lots of time at sea, or do you want more time in port? Do you want an itinerary that includes an overnight at a port of call so you can really visit a city? Learn about the itineraries various cruise lines offer before booking one. And, again, always keep your vacation goal in mind, and select the itinerary that will help you achieve it. You will have plenty of options when it comes to cruise lines, so spend some time learning about the advantages of each of them. A big differentiator is dress code; some cruise lines require a strict dress code including formal evenings, while others request nothing more than casual attire no matter what day it is. Another differentiator is dining; some cruise lines require a specific seating time to control crowds while others let you show up wherever and whenever you are hungry. The more you know about each cruise line’s travel style the easier it will be for you to minimize or (ideally) eliminate any opportunities for disappointment while sailing. When it comes to securing the best deal, you can find success whether you use a cruise planning company or work directly with the cruise line. Whatever you do, ask about deals, incentives, or special packages. Most cruise lines will offer promotions that range from free specialty dining and/or drinks to room upgrades or even a free guest in your stateroom, and some agents may include different or additional perks. Research your options are so you can pick the best deal. If there’s something you want that isn’t offered, ask for it anyway. You might be told it isn’t possible, but it’s entirely likely that the cruise line will throw in an internet package or room upgrade to make the sale. It’s like the old adage tells us: you don’t get what you don’t ask for! Don’t make demands, though—a polite request will be better received than an ultimatum. Many cruise lines are now offering confirmed passengers the opportunity to bid on an upgrade. This can help you secure a better room by encouraging you to offer a set amount of money for an upgrade; if your offer is accepted, you can score an upgrade at a fraction of its full price, and if your offer isn’t accepted you don’t pay anything more and keep the room you booked. Two words of caution: don’t book a room you don’t want and expect to upgrade when you receive an email to bid on a better room. If the cruise sells out you won’t receive the offer in the first place, and your offer won’t be accepted if someone bids more. Also, be careful to review the room types that are considered upgrades. On a recent cruise I found that the rooms considered upgrades didn’t include the single feature my family considered a must-have: an aft-facing balcony. Sure, the rooms might have been nicer, but without the right balcony they just weren’t a good fit for our trip. We all know flight delays are an ever-present part of travel, so avoid running the risk of missing your cruise (yes, it will leave without you) by flying in the day before, not the day of your cruise. That also builds in some time to track down or replace missing luggage if that becomes an issue. That advice rings true for your return as well; consider flying out the day after you get off the boat or, at a minimum, booking a flight for late in the day. Delays are rare on return trips, but they do happen. Case in point: the night before returning to Miami on a recent cruise, a tropical depression unexpectedly crossed through Miami, which shut down its port for several hours. Four cruise ships were delayed in this case, which meant passengers were late getting off the boat and US Customs was backed up for hours. I was grateful to have planned an extra day in Miami Beach so I wasn’t among the anxious crowds waiting in lengthy lines having to literally rush to their flights! There are, without question, unexpected costs that will add to your cruise budget. Your cruise fare will include most of your big expenses, but specialty dining, drinks, gambling, and some entertainment may require additional fees. Do some homework so you can have a good sense as to how much your final onboard bill will be, and keep track of those expenses as they come up so there are no surprises. Also, most cruise lines add mandatory per-person/per-day gratuities to your onboard guest portfolio unless you pay them in advance. Gratuities can add hundreds of dollars to your bill depending on your cabin and the length of your cruise, so include those in your onboard budget. Once you have your itinerary, pay attention to where your boat will be docking and how much time you will have there. 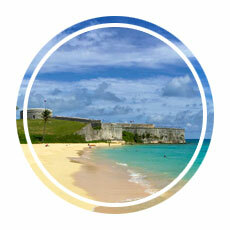 Then, spend some time looking into local attractions and activities before your cruise. That will help you decide if you want to book a tour, spend a morning exploring on your own, or perhaps stay on the boat and enjoy it while most people are on land (this can be a truly wonderful option on a large boat, as hot spots like the pool and the buffet are often wide open). Cruise lines offer travel insurance, but research other options to ensure you select the coverage that is right for you. Whatever you do, don’t skip it: accidents happen, even on cruises, and health care on the ship can be very (very!) expensive. On the last day of one cruise my family shared an elevator with a woman who had one arm in a sling. She had fallen off her bicycle in Ponta Delgada. I asked if she was insured, and she said no; her treatment on board set her back thousands of dollars, and it wasn’t clear if her UK insurance plan would cover any of it. “That was a very expensive mistake,” she admitted. 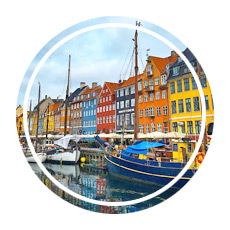 We have been very happy with the policies we purchased from World Nomads; you can click the link below to learn more or get a quote. Taking a seven-day cruise? Pack three or four outfits and wear each of them twice. Do you have six pairs of shoes in your suitcase? Take three of them out before you go. In addition to the fact your storage space will be limited in your cabin, chances are you won’t mind wearing the same outfit twice. Remember the cruise ship is, indeed, a ship: it will teeter from side to side as it navigates the ocean, which means you will also teeter from side to side. No, it won’t be like those howling gales in Hollywood blockbusters, but it’s definitely not solid ground. Stilettos will not help you regain your balance! Stick to flat sandals, sneakers, and other shoes that will keep you sure-footed. Also, outside decks do get wet, which means slippery conditions are likely onboard. Rubber soles will help you to avoid falling or slipping – but always be careful regardless. For the most part, hairdryers, hangers, and toiletries can be left at home—your cabin will likely have them for you to use, and you can request more if you need them. Check with your cruise line to confirm before you use valuable space and weight to bring them with you. One note: if you have a favorite shampoo or conditioner, consider packing a small quantity to take with you. I have been disappointed more than once when I opened my cabin bathroom door to find a bottle of combination shampoo and body wash, which dries out my hair. Medicines, including over-the-counter items like seasickness remedies, pain relief pills, or antacids. If you’re prone to seasickness, consult your personal physician before embarkation – great medical advances have been made here in recent years. Ginger chews, which are wonderful for upset stomachs and nausea, including symptoms brought on by seasickness. Note, though, with respect to the latter – these won’t work for everyone. Again, consult your physician. You will be in good company if you arrive early—many people will do the same, and the lines may quickly get long. 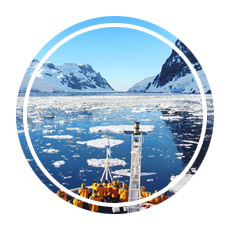 Don’t be discouraged, though; the lines often move just as quickly, and while it might take an hour or two you’ll still find yourself onboard with some time to get oriented before the required muster drill, which is required for safety purposes in the event the ship hits an iceberg. Just kidding. Port security isn’t nearly as intense a process as it might be at the airport. Passengers keep their shoes on and their laptops in their carry-ons, so the line will move faster and won’t require you to unpack and repack your bags. Be sure to have your passport and your cruise documentation in your hand, though—and be prepared to complete a form stating that you are healthy and have not displayed symptoms of the flu or norovirus in the days before your trip. Don’t cheat here – epidemics at sea, as we’ve seen in the news, can be awful. You are almost guaranteed to be separated from your large luggage for some time; it can take hours for it to be scanned and delivered to your stateroom. Take critical medicine, a bathing suit, expensive electronics and chargers, and other items that are necessary or will make you comfortable during your first hours on the ship in your carry-on bag. You might not miss your suitcase at all if you spend the afternoon by the pool! A benefit to getting onboard early is that you will have plenty of time to explore the ship—and that might be the most important thing you do! No matter how big a ship you are on, there will be tons of hidden corners, fun bars, and even full decks that you just won’t have time to enjoy. As people are settling into their cabins, walk around and take note of what looks interesting to you. Note the restaurants that you want to try, the location of entertainment spots, and where you’ll find the pool. The faster you know the layout of the ship, the more at home you will feel—and the easier a time you will have getting your vacation started! 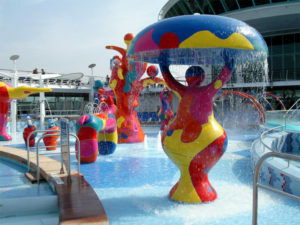 By the way – even when parts of the ship are very crowded, such as by the pool on at at-sea day, you might find a sundeck that you can have all to yourself – yes, even on a ship with 4,000 new friends. Even if you just want to play your vacation by ear, popular specialty restaurants and activities might require a reservation. Don’t miss out on experiences you want to have by waiting until the last minute (or even several days in advance) to book a restaurant or a show. After walking through the ship, circle back to guest services or to any spot that requires a reservation and take care of it on your first day—before other passengers capture the opportunity! Some people select windowless inside cabins while others enjoy more spacious rooms with balconies. How should you choose your cabin? Here are a few mini tips to consider. Inside cabins: These rooms are often the tiniest on the ship. They don’t benefit from windows, so natural light is not an option. Select this room if you are looking for the most budget-conscious choice and do not plan to spend a lot of time in the room. You can make up for the views the room lacks by spending extra time on higher decks and grabbing a lounging chair with ocean views. Window cabins: Ranging from portholes to full floor-to-ceiling windows, these staterooms may be on the small size but may also provide more square footage than interior rooms. These are a great choice for travelers seeking a balance between budget and room experience. Some lower-priced suites also have windows only. Balcony cabins: If you are looking for a semi-private way to sit outside, balconies are a great option. Typically priced higher than rooms without them, these cabins offer a place to relax with a cup of coffee at sunrise or a glass of wine at sunset. Pay attention when you are booking balcony cabins—many balconies are tiny, so look at square footage to see if the space you will have is worth the premium you might need to pay. Suites: If you have a higher budget, don’t pass up the chance to stay in a suite. In addition to having a bigger room and (usually) a bigger balcony, suites often come with extra perks like early embarkation, priority disembarkation on port days, free snacks delivered to your stateroom during the day, and even butler or concierge service for your onboard needs. These rooms have the highest price tag, but if you can spare the space in your budget the perks just might be worth the extra expense. On our recent trans-Atlantic cruise, having a suite entitled us to access a private bar, lounge, restaurant (which was superb), pool, spa, sundeck (three of these, actually), a concierge, and more – definitely worth it. Definitely. If you are prone to seasickness, or if you want to play it as safe as possible, pick a room in the middle of the ship on a lower deck. You will be less likely to notice the boat’s movements from that location than you will if you are closer to either end. ► Order anything you want! Can’t decide between the shrimp cocktail or the crab cakes? Order them both! Thinking about the filet but wondering how the tortellini might taste? Ask for two entrees! 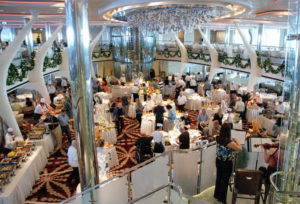 When you dine in one of the ship’s restaurants you are not limited to a single appetizer, entrée, and dessert. If you want to try a few things from each part of the menu, the staff will gladly bring you anything you request. You can even request that a dish offered as an appetizer be brought as an entrée to increase the portion size. Be mindful of what you are ordering—just because you can order everything you want doesn’t mean you should, especially if you won’t finish it. And you may find that the constant availability of vast amounts of food has lees appeal after the first few days anyway. You can buy dining packages in advance of your cruise at the a-la-carte specialty restaurants, or you can pay as you go. With few exceptions, you can avoid these (unless you really want to do otherwise). The food is likely to be excellent everywhere, from the included white-tablecloth main dining rooms to the buffet. Check the menus before you commit to a restaurant package to see if there are experiences you want to splurge on, and don’t be surprised if you find the buffet and the main dining restaurants will completely satisfy your palette. Some packages are offered as incentives when you purchase your cruise, which makes the reservation process the perfect time to negotiate them in. With rates averaging $75 to $90 a day, drink packages are outrageously expensive. If you consider the average drink price, including service charges, that’s about six drinks a day at a minimum, so only those dedicated to testing the limits of their livers need apply. Buy drinks individually if you will only have a couple in a given day—you really will save money. Again, the drink package may be offered to you for free when you book, in which case it’s a great idea. Lower priced packages for soda drinkers are available, but they, too, are not exactly cheap. Consider purchasing a water package; we paid just over $40 for 24 large bottles of (Dasani, our favorite) water during a two-week cruise, which ended up being less per bottle than we would have paid at home. You can take a reusable water bottle with you to save money, but filling up bottles can be difficult since that is not possible to do in most public locations for sanitary reasons. Dreaming of sipping coffee and enjoying an omelet in your room one morning? Or craving some pizza for a late-night snack? Most cruises offer room service for free or for a nominal service charge, so if dining in your room is enjoyable make use of this benefit! Many ships have at least one restaurant open around the clock as another option here. You’ll see them everywhere, especially at restaurants, so when you pass by a hand sanitizing station take an extra second or two to disinfect your hands. My favorite stations were manned by crew with spray bottles, cheerfully reminding you to, “Washy washy” before eating. It only takes one person to pass along an illness—again, don’t let that person be you! 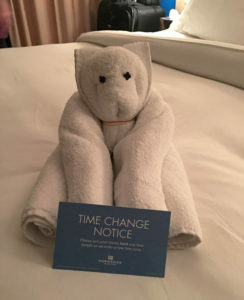 Time change notices and daily event schedules are often delivered with towel animals! You will receive a daily newsletter with information about all of the activities planned for the following day. Use that document as your guide to making the most of your vacation. If you are inclined to fill your hours with activities, cruise ships offer everything from demonstrations on how to fold a towel into the shapes of various animals to game shows to dance parties to lectures, and there’s guaranteed to be something you are interested in experiencing. Pay attention to start times and arrive early—it’s not unusual for specific events to fill up! There’s no better time to enjoy a massage or facial than during a sea day. If you’re interested in a spa treatment pay attention to specials and deals that are offered throughout the cruise. Port days often feature special pricing, and guests can sometimes score great deals on embarkation day. Many cruise ships allow guests who purchase a service to enjoy spa spaces like saunas or salt rooms, so purchasing one treatment might allow you to indulge in a full day of pampering. 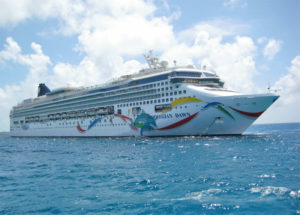 Your cruise ship will offer excursions on days you are in port, and they can be great ways to see a new city or region. However, they can be expensive, so before booking a tour do some comparison shopping to find cheaper alternatives or ways to create the tour on your own using local transportation or guides. That said, one good reason to book a tour through the cruise line is that if a cruise-sponsored tour is delayed, the ship will wait for the passengers—but if an independent tour is late to the dock, the boat will leave without them. Be sure to only book tours that will bring you back to the ship at least an hour or two before your departure! Think of a cruise ship as a floating, moving resort hotel run by a big for-profit corporation. The cruise line will be looking for every opportunity to separate you from ever-more of your money, and the endless array of high-margin (and not necessarily bargain-priced) jewelry, watches, alcohol, tobacco, and trinkets is a great way to do so. If you are going to shop, many items will be discounted toward the end of the cruise, so waiting can pay off. Most ships will also have a gift shop if you want to pick up a cruise-branded souvenir to take home with you. Along those lines, you’ll find sales pitches around every corner. If a product or service is something you really value, go for it, but don’t feel compelled to make a purchase. 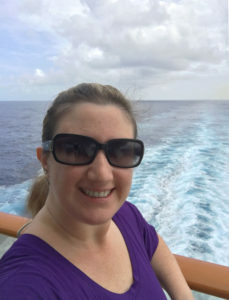 After a relaxing massage on one cruise I was a bit sad to have it end with a 10-minute review of all the products I “needed to buy” to ensure I remained stress-free. Not everyone will try to upsell you, though; just a day later, after a facial, my technician sheepishly told me she was supposed to try to sell me products, but she wasn’t going to do it. “Your skin is great—use what works for you,” she told me. I left feeling even more fantastic than I expected—and I didn’t feel obligated to spend a single cent more. On the other hand, we did take advantage of an opportunity for a discount on a deposit for our next cruise. As we noted above, gratuities will be added to your bill and can add hundreds of dollars to the cost of your trip. That said, gratuities may be the best money you spend on the ship—some of the kindest, hardest working people I have ever met have been on cruise ships, and my family often budgets more for gratuities so we can recognize the staff we interact with the most. You can give additional gratuities to crew in cash or through onboard accounts – so be sure to leave a little extra for staff that do an exceptional job for you, such as a concierge, cabin steward/maid/butler, etc. If there is someone who goes above and beyond for you, consider filling out a comment card or letting a manager know. Most cruise lines recognize crew members who make the guest experience outstanding at meetings or with promotions, so a few kind words can really make a difference. And you might be surprised by how much the crew impacts your trip; during my first cruise we got to know a great crewmember from Croatia so well that she had ice cream ready for us before we could get to her counter or would bring out extra surprises from the kitchen at dinner without us making a request. It’s been years, and I still smile when I think of her. If you really want to get the insider’s track during your cruise, talk with the crew. When my dad casually told our butler he loves Indian food, our butler was sure to let us know about a special Indian buffet lunch that was offered in a dining room a few days later. This wasn’t a well-advertised event, so we were among the first people to get in line before word got out—which meant we were relaxing with plates of food before the crowds really started to filter into the room. 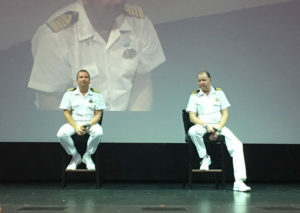 If we hadn’t heard about the event from a crewmember, we might have missed the whole thing! Before you leave home, grab a couple of blank thank you cards to give to crewmembers who really go above and beyond for you. It’s a nice, personal touch, and it’s a meaningful gesture for the people who work tirelessly to give you a terrific vacation. Even though boarding will start around midday for the next eager wave of cruisers, guests usually don’t have to get off the boat at the crack of dawn. Find out what the latest disembarkation time is and consider leaving around then. That way you can enjoy a leisurely breakfast or a last drink and let the masses go through the long lines first. This is especially true if you must clear customs at your final destination; those lines can get very long, so waiting might mean a shorter trip through immigration as well. If you have packed light, take your own luggage off the boat to save time. If you ask the cruise staff to carry your luggage off the ship you will need to be sure it is properly tagged and leave it outside of your stateroom the night before your cruise ends, which means you won’t have most of your belongings the next morning. If you are able to carry your own luggage, wheel it along to the closest elevator and enjoy the convenience of keeping it with you as you leave the boat. Many cruises are now offering internet packages, and they can range from minute-to-minute pay-as-you-go options to “high speed” unlimited access packages. Keep in mind that speeds no matter what will be slower than you are used to on land, especially during peak usage times, so even if you have an unlimited package the service may be unusably slow. However, on a recent cruise we found speeds were good enough to sustain FaceTime and Wi-Fi-enabled calling, which was worth the price. If you don’t have Wi-Fi calling, this article (written by Craig!) provides some great tips for how to make calls for free, and is also a great travelogue of our Baltic adventure. After eating your body weight in delicious food, burn off a few calories by taking the stairs. In addition to skipping the wait for an elevator, you will get in a few extra steps to keep yourself active. One morning, while serving myself some corned beef hash at the buffet, an irritated woman behind me sighed and groaned, “I wanted to try that!” I’m not sure if she thought I was going to serve myself the entire multi-gallon pan of hash (I wasn’t), but her attitude surprised me. A rather rude couple literally demanded that we move out of their way so they could put their lounge chairs where we were standing. That’s why I remind you: having a positive attitude can really shape your vacation. I have witnessed passengers yelling at staff for bringing only two clean towels when they wanted three and people elbowing others to get ahead of them. Just because you are on vacation does not mean your manners get the week off, too! Especially in 2017, after hurricanes ravaged the Caribbean, itineraries can change if a port closes or the weather turns bad and prevents boats from tendering. Keep this in mind when you book a cruise, especially during months where the weather might impact your plans. Remember to book insurance in case your trip changes drastically, and keep your expectations as flexible as possible. If a cruise is in your plans, we hope this monster cruise tips guide will help you to get organized– and get excited—about your adventure. And please let us know what tips works best for you and what tips we should add to our list! Ready to plan a cruise? Here are a few other sea destinations and ports we have really enjoyed!